WW1 Reenactments Equipment : Great War Tommy WW1 Food Rations Labels : XL Army Ration tin label, 1916. WW1 Reproductions and WW1 Reenactors Equipment / Kit - XL Army Ration tin label, 1916. "XL" Army Ration tin label, 1916. 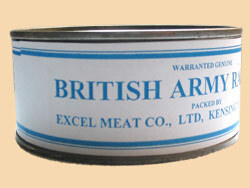 "XL", Excel Meat Company of Kensington, London, military meat & veg' ration tin label to fit 1 1/2 " x 4" diameter tins. All can labels can be re-used if 'gummed' as opposed to 'glued' to cans.